Universal Asynchronous Receiver/Transmitter (UART) is a method of serial communication allowing two different components on a device to talk to each other without the requirement of a clock. 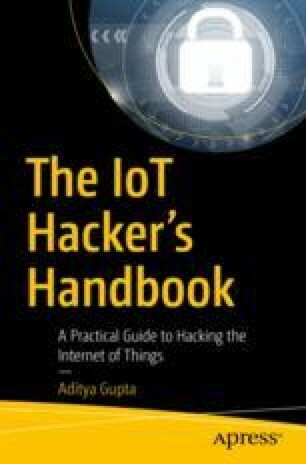 We consider UART in depth in this chapter as it is one of the most popular communication interfaces that has great significance in IoT security and penetration testing. There is also something known as Universal Synchronous/Asynchronous Receiver/Transmitter (USART), which transmits data both synchronously and asynchronously depending on the requirement; however, we have not seen a lot of devices using it. For that reason, we won’t be covering USART, and focus instead on UART.